There’s nothing better than a warm soup on a cool day. 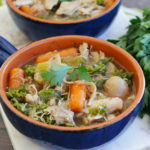 Our Keto Chicken Soup is not only good for the soul, but for replenishing your whole body. From aiding in the detoxification process to lowering inflammation, and from maintaining heart health to keeping you in ketosis, we’re certain you’ll be making giant batches of this on repeat all season long! Fun fact: you know how when you crush garlic it has that crazy potent smell to it? That’s called allicin. This enzyme is basically a defense mechanism that garlic releases when it’s crushed. And, it’s so powerful that it’s been linked to reducing inflammation within the body and the risk of several illnesses, including heart disease [*]. Something else that’s epic about garlic is that it keeps vampires away. And by vampires, we mean bad cholesterol. Studies have shown garlic not only reduces inflammation but also lowers LDL (or low-density lipoprotein) aka bad cholesterol and regulates HDL (or high-density lipoprotein), while its at it. This is great, especially for those suffering from type 2 diabetes [*]. Bone broth is also pretty epic because it’s good for just about everything in your body, including your gut. Time and time again our gut has been referenced as “our second brain”. If your second brain is out of whack, then the rest of your body is out of whack. By consuming more bone broth, you’re getting some essential aminos acids and collagen/gelatin that bone broth contains. These work in conjunction to help seal up any openings in your gut lining (aka leaky gut syndrome). By healing your gut, you’re significantly reducing overall inflammation within your body. Grass-fed butter contains a helpful little fatty acid called butyric acid. You won’t find it on a store-bought nutrition label but this healthy acid is very beneficial for reducing inflammation, especially with those suffering from Crohn’s [*]. Kale. We all love it but is it more than just a trend? Oh yes. Kale lives up to its hype for sure. It contains glucosinolates which are broken down into metabolites during the digestion process. Your body already naturally produces metabolites to help regulate your metabolism. But it also promotes enzymatic reactions, such as detoxification! You might be thinking shut the kale up, but it’s true. Some seem to forget about the low carb, keto option that is the radish; however, it’s time for them to shine. Radishes contain anthocyanins, which is a flavonoid also found in berries, such as blueberries. Studies have shown that by consuming foods with anthocyanins, you are lowering LDL (low-density lipoprotein) and helping regulate HDL (high-density lipoprotein) [*]. When this takes place, you’re simultaneously reducing inflammation and the risk of cardiometabolic disease. You may have heard the rumor that saturated fats cause heart disease. This general assumption was made by The American Heart Association. However, this was proven to be false and everyone was able to go back to their regularly scheduled program without fear of eating healthy, saturated fats, such as chicken [*]. Consuming healthy saturated fats like chicken also improves cholesterol levels. By doing so it reduces the risk of cardiovascular disease. Who knew one cup of this satiating soup could hold so many health benefits, while also keeping you in ketosis! Turn Instant Pot ON and set to SAUTE function +10 minutes, melt butter. Lightly season chopped chicken thighs with 1/4 teaspoon salt and a few pinches of pepper. Add chicken to Instant Pot and brown for 3-5 minutes. Add all remaining ingredients (EXCEPT kale) to pot. Turn Instant Pot OFF, then back ON, set to STEW function +25 minutes. Replace lid and close valve. When timer goes off, release pressure manually. Shred chicken, stir kale into soup, and adjust salt and pepper to taste.